I just ordered Cheerful Weather for the Wedding because Kay recommended it and her description made me think of Steel Magnolias–I can’t wait for it to come (aka The Wake is D-A-R-K). Now what is this movie adaptation? I dunno but it has the mom from Downton Abbey! Is it just me, or is it hard to find CanLit novellas? Yes, that’s my approach too! Put everything on hold, see what comes in. It begins! Luckily I get to close my Giller reads and start my Novellas in November reads with the same book: Fifteen Dogs. Really liking it so far! Do you recall how many novellas you’ve read in previous years? Is 7 a standard amount or is it more/less? Probably more like five. My list is more a starting point than a goal. I have a bunch more holds that came in too so probably will have a TBR part two! Count me in! 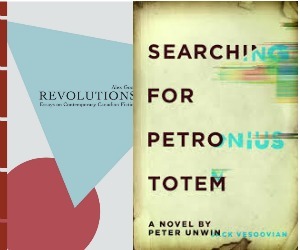 Quattro Books publishes Canadian novellas and could be a good place to start. I’ve read one or two of their books. Joining this year! Haven’t read too many novellas before so looking for some suggestions! Hello! I *did* read a Novella in November, but then I couldn’t remember who was hosting it. It wasn’t until I read your end-of-year wrap-up that I found you again *smile*.